While at the local grocery store I noticed a can I had never seen before. A white camouflage pattern ironically helped this product to stand out from the usual energy drink fare scattered around it on the overcrowded shelf. 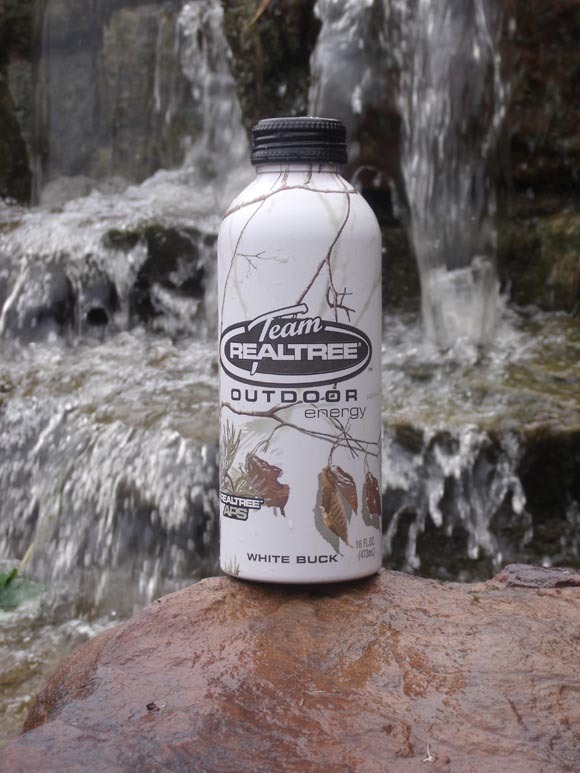 Team Realtree Outdoor Energy is the name of the drink and White Buck is the name of the flavor. A few questions enter my mind, I will list them now. One, do outdoorsmen really need their own energy drink? What exactly is White Buck flavor? Does someone really need a can of something that needs to be camouflaged? Only one of those questions will be answered by me so I decide to take the plunge and purchase the Team Realtree product and cart it back to my proverbial deer stand to take a shoot at what this stuff is all about. The can is now chilled and I try to open the twist on cap. The cap is difficult to take off, but I finally extract the required piece and set about to taste the White Buck flavor inside. Before I take a sip a rather sickly smell greets my nose. It smells like weird cherry flavor. I read the ingredients and find that HFCS and all sorts of other common ingredients are found inside. So I take a gulp hoping that the taste does not resemble the smell. A strange taste most similar to cherry flavor washes across my mouth like a tidal wave. The carbonation is strong and I take another sip and am met with similar results. I don’t find the taste offensive and it seems to stabilize the more I drink. After about a quarter of the can I have had enough and halt the review. Now the reason why this can is camouflaged has become all too clear. Final review: Do not buy! Folks there are several energy drink products on the market that not only taste great but are actually made with decent ingredients; Team Realtree White Buck Flavor is not one of them.